Moth is an orphan who lives in Calio, the highest city in the world. He lives with Leroux, an old man who has been looking after him since his mother passed away, and he works at Calio’s aerodrome, from which the elegant flying machines known as Dragonflies depart. Leroux often tells Moth tales about a rumoured land beyond the Reach - a sea of fog from which no man supposedly returns. An unexpected change, however, forces Moth and his best friend Fiona to cross the fog, and to discover whether the tales about this land, home of the Skylords, are true or not. 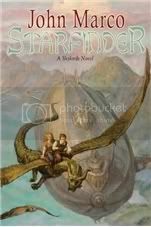 And so begins an adventure involving flying machines, birds that are not what they seem, mermaids, centaurs and dragons, a strange instrument called the Starfinder, and several secrets and revelations. I really liked Calio as a setting, partially because of the steampunkish feel it has due to the Dragonflies. The first few chapters of the book put me in mind of the lovely Myazaki movie Laputa: Castle in the Sky. Most of the story, however, is set in a second alternate world, the land beyond the Reach, and that’s more of a traditional fantasy world. Not that this is a bad thing. It’s just that as a setting it isn't as unique or interesting as Calio. Starfinder is a plot-oriented adventure story, and as I was saying recently, I’m more of a character-oriented reader. But I do enjoy a good old adventure story every now and again. And by saying it's plot-oriented I don’t mean to imply that Starfinder has vapid characters. Not at all. The characters are fully-fleshed, and what I liked the most was how complex their relationships with one another were. It’s hard to talk about this at length without giving too much of the plot away. Suffice to say that the characters are not easy to pigeon-hole, their perceptions of one another change as the story progresses, and Moth and Fiona in particular change and grow. Time for the down-side: the writing. Not the writing in general, but something very specific about the writing. How do you feel about the verb “to say”? Personally I’m very fond of it. I like how, because we’re so used to it, when used in dialogue it’s practically invisible. And this means that it never becomes repetitive, just like “to be” never becomes repetitive. More expressive alternatives can of course be used, but most of the time, “s/he said” is just fine. I’m not sure if anyone else is bothered by this, but it’s a pet peeve of mine to see writers use as many unnecessary alternatives to “s/he said” as possible. The characters in Starfinder quip, chirp and query. They bellow, boom and blurt. They grouse, growl and groan; hiss, scoff and fume. More: they sputter, snap and sneer. They even snort a time or two. Maybe I sound picky, but this is something that can really drive me crazy. First because most of the time the verbs don’t add anything that is really necessary in terms of meaning; secondly, because they tend to add comedic undertones even to scenes that aren't supposed to be funny at all. And finally because I find it very distracting. I can’t pay attention to what the characters are saying if my brain is busy trying to guess what the next unusual verb is going to be. I just can’t help it. But like I said, this is me. Starfinder is an enjoyable book regardless. I like the fact that even though it’s part of a series, it has a satisfying ending. It definitely leaves room for more (and I have a feeling the next book will be mostly set in Calio, which makes me happy), but the story we have here has a beginning, a middle and an ending. Starfinder will be out in May. Thanks for the review Ana. I appreciate it. And yes, the next book will take place largely in Calio. I haven't revealed this yet anywhere else, but it will be called "Skyknight." I never heard of this book! Personally, I like it when authors use verbs to describe the tone of voice, rather than just "he said." But there has to have a reason for the emphasis. Using those kind of verbs constantly to describe voice would probably be overkill and annoy me, too. Ah, drat, shouldn't have read this review yet. I'm about 100 pages into this book at the moment, and I hadn't noticed the dialogue tags... but now that you've pointed it out, I'm not going to be able to NOT see it. John Marco - Thank YOU for the book, for the story, and for not hating me for being picky about dialogue tags :P And Skynight! I'm happy to hear my feeling about Calio was right. Looking forward to it! Jeane: Probably because it's new! I'm weird about it...for example, Terry Pratchett uses them very well, but I think one of the reasons why it works for me is because it' meant to be funny. Same with his use of adverbs. But comedy aside, I prefer the emotional tone to be subtle and implied rather than explicit. Fyrefly: Sorry! I hope I didn't ruin it for you. I look forward to your thoughts on the book. Nymeth, no worries! I actually quite liked your review. As for the tags, well, to each his/her own, I guess. You're the first person to point that out, so maybe it won't be a big deal for other readers. But I'm always grateful to bloggers who take the time to read and post their thoughts. And I'm glad you're looking forward to Skyknight! I seem to recall that in English classes in middle and high school we were told to find other ways to say "said." I had a teacher who actually deducted marks if we used "said" more than a couple of times in a short story. But I always thought that was ridiculous because sometimes my characters just "said" things, they didn't bellow or whisper or squeal. It's a hard habit to break. I'm looking forward to getting my hands on this one! It sounds fascinating. I'm a big fan of steampunk, so very cool. Thanks for linking up to my review. I'm glad that you did enjoy this one, despite the annoyances. I had the same complaint about another book recently - that kind of thing drives me batty! I remember having to rewrite stories in Secondary school if I used 'said' more than twice - my teacher used to count them. This book sound really good - I can't believe it doesn't come out till May - is that in the UK to? John Marco: There are probably as many reading pet peeves are there are readers :P And I'm looking forward to it indeed! Kiirstin: I had a teacher who made us do that too. It drove me mad :P I'm not much of a believer in strict rules for writing, but I've seen advice about this in both directions. This pretty much describes my experience as a reader, but I've seen the opposite being said as well. Scrap Girl: Like I was telling Kiirstin, I had a teacher who insisted on that too, but I never agreed :P And that's a good question about UK publication date. I hope there is one! Nymeth, great review. This book sounds like a good adventure. YOu know I think we all have pet peeves when it comes to writing. There are things that will drive me crazy too. That aside, the cover on this book is great too. Ok - now I just have to share a story I personally find extremely funny. I have an agency client that hires me to write copy (in English) for one of their clients. The copywriter at the agency resents this because he thinks he can write English copy (he can't). So anyway, one day, they had me write a press release. The triumphant feedback from the agency copywriter was that it wasn't very good because I always used "said" to attribute quotes and that I should use more action verbs to make it exciting! I had to tell the boss that press releases use "said" as a standard, and using anything else just sounds ridiculous. I'm a fan of more character-driven books as well but a good action story is fun every so often so I'm looking forward to this one! This sounds really good! Now you're tempting me with books that aren't even out yet :p You did that on Twitter earlier too with that new Gene Luen Yang book! This sounds really cool though. Dialogue tags can drive me nuts sometimes too, but as long as the story's great, I'm good! I have that exact same pet peeve, but then I have a whole bunch of others that can seriously keep me from enjoying a book. Overuse of ellipses and dashes are my two biggest issues. I'm still really wanting to read this book though! If the story is good enough, I can ignore the words, and it sounds like it is. i've had my eye on this one for a while.. this will make it go on the wish list. Oh, this definitely sounds like an Annie book! Just wanted to pop in again and answer Scrap Girl's question. There is no UK publisher for the book yet, unfortunately. But we are actively looking for one so hopefully that will change! Thanks also to everyone else for commenting about the book. For anyone who wants a pdf of the first chapter, you can contact me via my website to request it--www.johnmarco.com. I saw a few people with ARCs of this book. It looks pretty good! Have to keep it in mind for May. Dar, thank you. I agree about pet peeves, and also about the cover art! Love it. Iliana, I look forward to your thoughts on it! Chris: lol! And look, I'm doing it again :P You already want this book, though...it just may be that you don't know you do yet. Meghan: Hooray, I'm not alone! Ellipses all over the place drive me crazy too. Dashes not so much...in fact, I think I'm guilty of overusing them myself :P And yes, the story is a good one. Deslily, I think you'd enjoy it! Debi: I think it is! John Marco: I hope you find a UK publisher soon! Kailana: I almost never get to read ARCs (few authors/publishers are willing to send them all the way here), so I was really excited to get this one! I think you'd enjoy the book. I recently heard about this. I tend to be very picky about books in this genre but this sounds very neat! I've heard it's supposed to be a trilogy? I have this book too but haven't read it yet! :( Soon, hopefully. I like this cover, so vintage looking. It sounds like a good read. great review :O) you always pick such unique books and give such excellent reviews on them. Ladytink: It is, but so far it seems more of a 3-stories-set-in-the-same-world sort of trilogy than a 1-story-in-3-books trilogy. I could be wrong, though! Josette, hope you enjoy it when you do! Thanks for reviewing another book I have never heard of that sounds fun! I loved your negative comments about the writing style, had me laughing and frightening my cats :) I do know what you mean and it can get irritating when it is all the time. Like you say it takes the focus off what the characters are saying. Overall though it does sound like a fun book.